The Cyclades are some 220 islands scattered in the central Aegean. Their white-washed houses, tiny chapels, volcanic calderas and excellent beaches are hero-images of Greece, and under the sparkling summer sun there are few places in the world that can match their beauty. 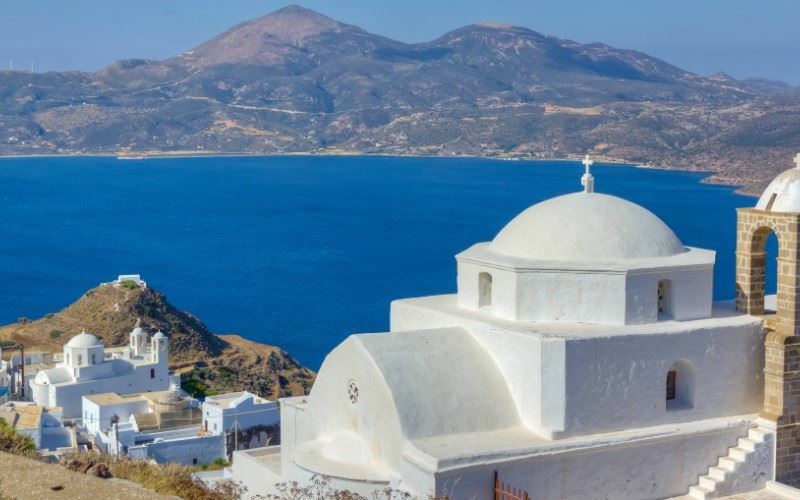 Whilst the Cycladic islands of Santorini, Mykonos and Naxos are well-known, the westernmost islands of the group - Folegandros and Milos - are hidden gems with small visitor numbers outside of the high season. Discover the real Greece on our 7-night island hopping holiday. Flight from the UK to the Cycladic island of Milos, via Athens. On arrival on Milos it is a short transfer to the charming Mirabeli Apartments in Apollonia. Overnight at the Mirabeli Apartments. Time to explore the 125km coastline and some of the island's 71 beaches. It is not just the unspoiled coves and stretches of sandy shore that Milos is famed, the island also has colourful villages, castles, archaeological sites and volcanic grottoes to discover. After breakfast, transfer to Milos harbour for your ferry crossing to Folegandros. The journey between the two islands will take c.3 hours. On arrival at Folegandros it is a short transfer to your boutique guest house. Overnight at the Kallisti Hotel. This is the 'jewel' in the Cyclades which remains true to the austere beauty of its rugged and undulating landscape. There are some excellent beaches but, the attention of most visitors is drawn towards the caldera, the cliffside village of Chora and the island's numerous marked walking trails. In Spring the island is a carpet of wildflowers which, against the white-washed settlements, is a wondrous scene. After breakfast, you will be transferred to Folegandros harbour for your return ferry crossing to Piraeus. The ferry will take c. 4 hours and on arrival in Piraeus you will be met by a private taxi and transferred to the airport for your return flight to the UK. These 7 bungalow-style apartments stand in quiet pretty gardens a short walk from village and beach. They comprise an air conditioned living room with 2 built-in sofa beds, a simple kitchenette (2 rings, fridge) and TV; a tiled shower room (some with ½-bath); and a rear double bedroom (also AC). All are ground floor except for the superior apartment which is first floor. Furnishings and decor are simple and attractive. To the front is a generous covered terrace with fine views over the colourful gardens to the sea. Walk over the road and down a small path to find a lovely little sandy beach, with shade in just a couple of minutes - you can also swim from the flat rocks here. The harbour and main beach is a 3-4 minute walk down the hill. The Kallisti is a small family run B&B hotel on the edge of Chora.